I see her when game is loading. And I cant find her in guide. 4 cd, 1 attack, 16 life. 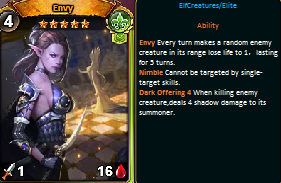 Envy: Each turn, one random enemy creature in range has HP reduced to 1 for 5 turns. Nimble. When it kills a creature, deals 4 damage to the opponent. Nice. Very strong ability. How to get her? She's a Virtue, so it's a 30000(?) gold recharge like the tarots. Not worth it imo. Envy makes the world go round! Plus, I see this whole 'vice and virtue' thing as pretty subjective anyway - some vices are good for some things, and likewise, virtues can be a hindrance too. This vice or virtue point your are making is the nonsense not Myth's pov.. Vice and virtue, they are the same thing, just like tarots..
Now we can get envy by rechearging 8000 gold. Do you have Envy is it useful card?